In Winter months, Indian vegetable market are flooded with Broccoli, which is still not so commonly known by people in India. Broccoli : Broccoli is named one of the healthiest food. It is low in calories, broccoli is rich in many essential vitamins and minerals, in addition to fiber. A cup of cooked broccoli offers as much vitamin C as an orange, and is very rich in beta-carotene. Broccoli contains vitamins B1, B2, B3, B6, iron, magnesium, potassium, folate, lutein and zinc too. Broccoli is a particularly rich source of a flavonoid called kaempferol. This kaempferol connection helps to explain the unique anti-inflammatory benefits of broccoli. Cooking methods of Broccoli : Cooking methods can impact the nutrient content and health benefits of broccoli. Boiling can leach up to 90% of the valuable nutrients from broccoli, while steaming, roasting, stir-frying, and microwaving tends to preserve the nutrients. One of the way, I consume Broccoli mostly is make a warm soup out of it, so that I can gain most of the health benefits from it and it tastes so great. 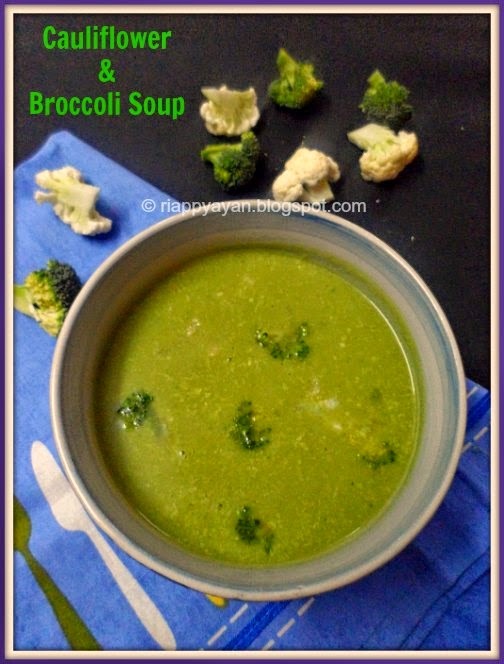 I just love broccoli soup, this time I included Brocooli's sister, Cauliflower too in this soup, together it was out of this world...really, try this out to believe me. As you all know cauliflower is also very healthy vegetable, also a h=great source f Vitamin C.
Dunk broccoli and cauliflower florets with warm water for some time, then carefully wash all the florets, have a good checkout for small insects in between florets. Heat oil/butter in a pan, add onions and garlic and saute for a minute. Then add broccoli and cauliflower florets and saute a little. Add 1 tsp. salt and then add chicken broth or water and cook until they are just done. Let it cool a bit. Then put the whole thing in a mixer and blend well. Now add the pureed vegetables on the pan again, mix the milk and let it come to boil in low flame. Season with salt and black pepper upto your taste. You can also add little cornflour mixed with 2 tblsp. water and add it to the soup if you like thicker soup, otherwise just avoid this step. When the consistency comes to your liking, remove and serve hot with some warm bread or as it is. 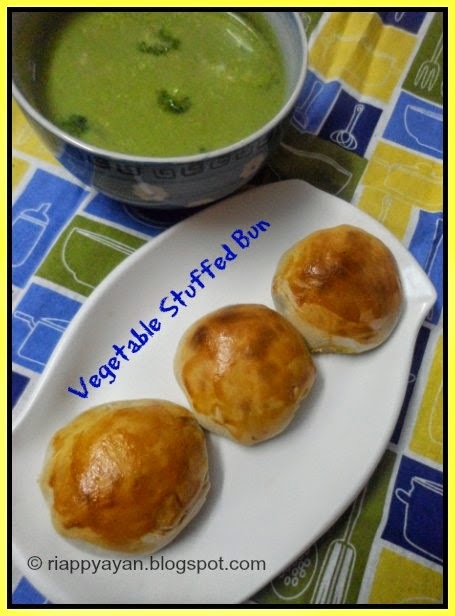 I served mine with some homemade Vegetable stuffed Buns. Colourful and delicious looking soup. Excellent preparation. Very healthy as well.